In this last week before Christmas, it is worthwhile to reflect upon the Holy Family and on what they were doing at this time about two thousand years ago. Mary and Joseph knew that they would have to uproot themselves and undertake a journey to Bethlehem. This was necessary because of the decree of Caesar for everyone to return to their native town for the census. Although Mary was with Child, they were not exempt. 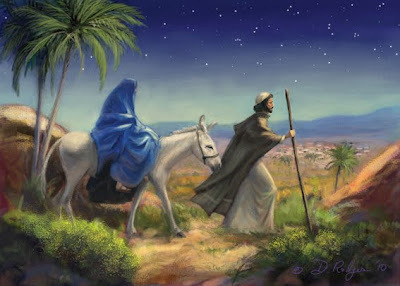 So, off they went: Mary, Joseph and the unborn Son of God and Mary. They had a tremendous trust in God, knowing that, if God said that Mary would be the mother of His Son, everything would turn out all right. They probably had to sleep outdoors. They had to endure the cold of night and whatever else mother nature delivered. They did not have reservations at an inn. So, there was the question of where they could be safe and warm. Just imagine how St. Joseph felt concern not about himself but about his wife and his foster child. Mary would have been concerned with the place in which Jesus would be born. They, nevertheless, cooperated with God, and He provided. They did not have the best of conditions for this first Christmas, but they were safe under God's protection. We always can learn something new from the Holy Family. One lesson for mothers with child and the fathers is that they should not feel threatened by unfavorable circumstances. The political power twenty centuries ago was against the birth of Mary's Child. A king tried to kill Him. No matter how difficult it may seem to a woman to bring her unborn child to term, God will always get her through it. But, she needs trust in Him. We probably do not know the pressure that is put upon young girls and women to abort their children. They are urged to do so not just by friends and counselors but even by their own parents and family members. It really is a bad situation for many of them. Yet, in spite of it all, they are able to do the right thing and protect the lives of their little ones and have peace. God not only comforts them but also provides help. There are many Catholic groups that support and help women who think that abortion is the only option, such as Several Sources Foundation. They will even provide them with a place to live and help them take care of their children. So, this is God helping some through the cooperation of others. We too can learn from the Holy Family. We may not have to protect a baby from adverse circumstances, but we often encounter unfavorable situations, some serious and some not so bad. We just need to have that hope that our heavenly Father gives us. We need to say what Jesus asked us to say through St. Faustyna: "Jesus, I trust in You."